Calder Classics recently caught up with Simone Oppen and Anna Conser, directors of the Barnard Columbia Ancient Drama Group's Choephoroi, an ancient Greek tragedy written in the late sixth / early fifth century BCE. We discussed the challenges of staging a play entirely in ancient Greek, composing an original music score, and the unique role of the chorus in this haunting tragedy about family relationships and the self/other. Aeschylus was a playwright in late 6th / early 5th century BCE Greece. 1. Aeschylus's Choephoroi is a poignant but rather gruesome tragedy of a son (Orestes) killing his mother (Clytemnestra) because she killed his father (Agamemnon). Why did you select this play to perform this spring? We initially wanted to stage one of the lesser-performed tragedies of Aeschylus, as of his seven plays the Agamemnon receives disproportionate attention on the modern stage. This desire did not narrow our selection all that much, but of the three strongest contenders (Prometheus Bound, Persians, and Choephoroi) we made our decision on Choephoroi on the basis of its performability by students and capacity to hold a modern audience's attention. The balance of roles in the Choephoroi and, in particular, the dynamism of the chorus in this play offer varied roles to a large number of participants while the stage action in the second half of the play makes Aeschylus' skill as a writer of texts for performance resoundingly clear. 2. It's also typically the second of three in a trilogy. Does this play stand alone or does the viewer need to know the story of the preceding and subsequent parts of Aeschylus' trilogy? Though staging the full trilogy would have been the ideal, the other demands on student performers' time within the semester make such a performance unfeasible in a university setting. Knowing the preceding and subsequent plays in Aeschylus' Oresteia trilogy deeply enriches one's perception of the Choephoroi. Nonetheless, we believe that the action of this play makes it particularly well-suited to stand-alone performance. The main event of the Agamemnon (the eponymous king's death) is abundantly discussed and sung of in the first half of the Choephoroi, allowing even an audience member who has not seen the first play to understand that Orestes kills his mother to avenge his father's death. As we staged the play, the final scene encapsulates Orestes' descent into madness, the situation the final play of the trilogy, the Eumenides, seeks to correct by purification and trial by jury. Our performance also used props and staging to approximate what is arguably one of the most exciting takeaways from reading the entire Oresteia, the development of imagery across the whole trilogy. To name one example of our attempt to approximate this development: the material from which the tokens by which Electra recognizes Orestes came from the cloak that Clytemnestra first appears in and with which her corpse (and that of her lover Aegisthus) is covered at the play's end. The way in which Orestes plays with this cloak in the final scene from our production is our attempt to give the audience an idea of the net imagery vividly used to describe Agamemnon's death in the first play in the trilogy. By allowing the cloak which has accreted meaning over the course of performance (as a token of recognition and a garment) to become a net, the stand in for a body, a display piece for helios (the sun god), and finally a shroud in this final scene, we attempted to approximate the rich language of nets that runs through the first two plays of Aeschylus' trilogy. 3. You all did a stunning job performing the entire play in a language that no longer has any native speakers, ancient Greek. How long did it take the cast to memorize the ancient Greek? What are the benefits to performing the Tragedy in the original language and not in translation? Thank you! The cast and chorus are to be commended for their hard work not only in memorizing, but in inhabiting this ancient language by acting in it. A core group of students (ourselves included) began working with the ancient Greek text in Professor Nancy Worman's class on Greek tragedy in Fall 2013. We cast the play by open audition in November and sent our student actors and chorus members home with their lines to memorize over the winter break (with not a single line cut from the Greek original, I might add). At a very practical, pedagogical level performing a Greek tragedy in the original provides an invaluable opportunity for the student of ancient Greek to learn this language in a way which approaches the experience of learning a modern language in a full immersion environment. By recruiting their ears and voices, our student performers transformed an often silent, individual experience into one more like the communicative reality of a modern, spoken language. At another level, performing a tragedy in the original preserves the untranslatable poetry of the ancient Greek original and allows for the exciting possibility of reconstructing this poetry into music. 4. What was one of your biggest challenges in directing the play and how did you overcome it? My biggest challenge in directing the play was doing justice to the music written by our composer Melody Loveless in training a chorus of 11 with very different levels of music and dance training to sing the vocal part of her orchestration while dancing in unison. We were fortunate in having a chorus which combined musicians far more skilled than ourselves and incredibly hard workers, ingredients without which the near full singing, dancing chorus (an ancient chorus had 12 members) would not have been possible. 5. I was interested by the role the chorus plays in this tragedy. First they encourage Orestes and Electra to seek vengeance and act on their present anger. Then they rejoice in response to Orestes stabbing his mother, only to lament at the end that that this cycle of retributive murder continues into the future. 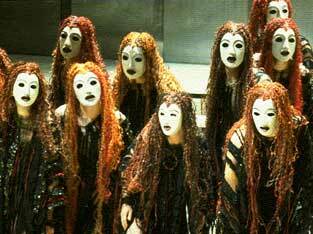 What role do you see the chorus playing in the Choephoroi and is it any different from other ancient Greek tragedies? I think that the chorus' role in this tragedy is a remarkably active one that is distinct among the roles given to choruses in other ancient Greek tragedies. At several moments the chorus members of the Choephoroi allude to a song that they would hypothetically sing or will sing in future time. Intriguingly, this song occurs in a very specific context: over Clytemnestra and Aegisthus' dead bodies once Orestes has killed them in an athletically-styled contest. So the short answer is that, in my opinion, the chorus' vision of how retribution will take place shapes this tragedy much more than people give it credit for and that the agency the chorus has in shaping this retribution is unique in Greek tragedy. This agency does not, however, relieve the chorus and Orestes from having to deal with the fallout of murder (as opposed to the version of it in song which can be unproblematically glorified). 6. You also collaborated with Melody Loveless on an original score developed directly from the metrics and pitch accents of Aeschylus' lyric verse. What do you think this added to the tragedy and why did you choose to include it? As I mentioned above, the poetry of the Greek original is basically untranslatable. By working with a composer and preserving both the meter of the Greek songs and their original length, we tried to approach this poetry and to transform it into music. This music, in my opinion, was the most powerful and enchanting aspect of our production. To learn more about the Barnard Columbia Ancient Drama Group and see rehearsal photos from the Choephoroi, visit their blog here. Thank you to Simone Oppen and Anna Conser for taking the time to speak with us.